A teaser video has appeared on BMW Motorrad Malaysia’s Facebook, showing the 2019 BMW Motorrad C 400 scooter with a caption saying its urban two-wheelers, the C 400 X and C 400 GT, will be in Malaysia soon. Featuring BMW Motorrad Connectivity, the C 400 pairs with the rider’s smart phone and allows got navigation, playlist management and answering phone calls. The C 400 X and GT will join the BMW Motorrad C 650 Sport and C 650 GT scooters in Malaysia, priced at RM68,500 and RM72,500, respectively. While no information has been forthcoming on pricing, we hazard a guess at the C 400 range of scooters coming in around the RM45,000 price point. Carrying a 350 cc, liquid-cooled, single-cylinder with overhead cam and four-valves, the C 400 produces 34 hp at 7,500 rpm and 35 Nm of torque at 6,000 rpm. 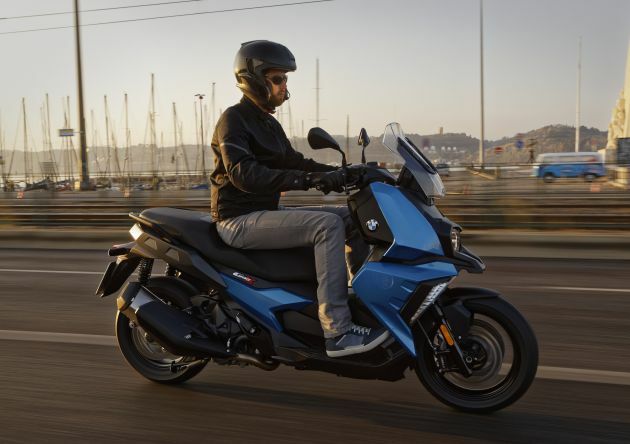 Power is transmitted via a CVT gearbox, as is the norm for scooters and BMW claims a top speed of 139 km/h for the C 400 X and 136 km/h for the C 400 GT. Rolling on 120/70 ZR-15 and 150/70 ZR-14 cast aluminium alloy wheels, the C 400 is braked by 265 mm double-discs with four-piston hydraulic callipers in front and a single 265 mm diameter disc in the rear, clamped by a single-piston floating calliper. BMW Motorrad ABS is standard, as is automatic stability control (ASC). Suspension is with 35 mm diameter telescopic forks and the rear end is propped up twin spring struts, adjustable for preload and an aluminium swingarm. Seat height for the C 400 is set at 775 mm while weight is claimed to be 204 kg for the C 400 X and 212 kg for the C 400 GT, ready to roll. Fuel capacity for the C 400 is 12.8-litres with fuel consumption claimed to be 3.5-litres per 100 km. Colour options from the BMW Motorrad catalogue include Blackstorm Metallic, Moonwalkgrey Metallic and Alpine White for the C 400 GT while the C 400 X comes in Zenith Blue Metallic, Alpine White, Black Storm Metallic, though it has not been confirmed which colour schemes are likely to make it to Malaysia. Whine, whine all u want. Tak mampu duduk diam2. Bukan tak mampu, harga tak masuk akal bro.. Its not even an engineering showcase, just a mid sized basic scooter..
Harga mcm mbazir.top speed pn tak kemana.baik beli Yamaha or Honda. Ur saying u never seen the Emporio Vespa? That kind of price tag for a Maxi-scooter, and moreover a MID-Sized Maxi does not make any sense except for the fact that ur paying the excess only for the BMW tag!! Its not even substantiated with BMW’s own semi-active suspension setup, designed in Germany but build in china, 350cc single cylinder to be exact. Thus truly the excessive price tag is seriously for the BMW logo !! Even the proper beginner scooters such as NMAX & PCX can tapau this guy for Fuel Efficiency.. Get the bigger XMAX for better top speed & comfort or get the truly premium Maxi Scooter TMAX or the crossover X-ADV for much discounted price than the BMW’s C 400! !